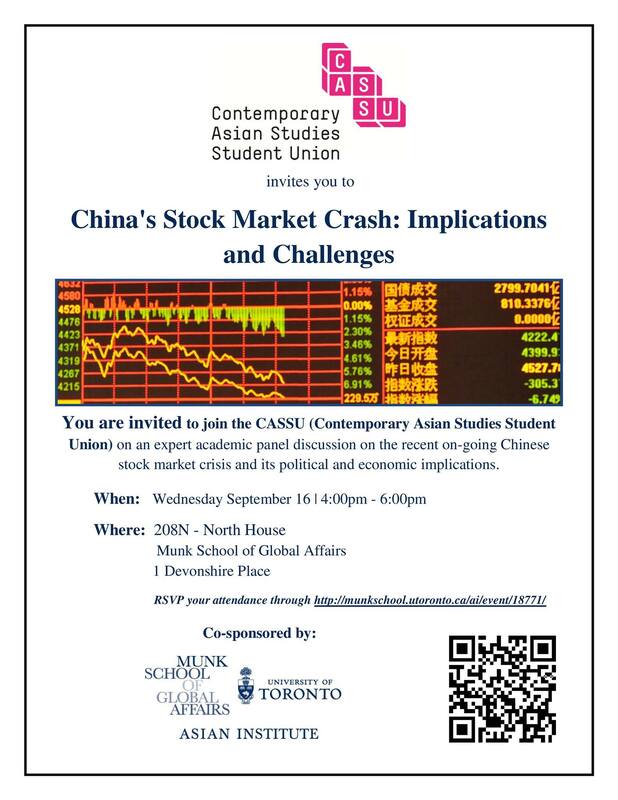 CASSU would like to officially announce its first academic event of the 2015-2016 academic year entitled “China’s Stock Market Crash: Implications and Challenges” on September 16th from 4pm-6pm (reception later) at 208N Munk School of Global Affairs. The Chinese stock market crash began with the popping of the stock market bubble on June 12, 2015 when a third of the value of the Chinese A-shares on the Shanghai Stock exchange was lost within the course of one month. The event has alarmed investors globally and has initiated a series of vibrant conversations centred on the inner workings of the Chinese economy and its authoritarian government policy implications. Several schools of macroeconomic thought plugged into rigorous debate with each other after the announcement from the Chinese central government in that it intends to use aggressive approaches to intervene in the Chinese stock market to prop up the stock prices and conduct heavy investigations into the possibility of illegal short selling. Proponents of the market forces argue that this is a perfect scenario of a long time government interventionism that has failed, while others argue that the crisis has emerged due to insufficient government interventionism and monitoring of the Chinese stock market in recent years. The concern now centres on the possible spread of the stock market downfall on other Chinese domestic sectors and its potential global implications. The question of the regime stability of the Chinese government also comes into question. This 2 hour expert panel will focus on examining the reasons behind the Chinese stock market crisis and the political and economic implications that it has had or will have on domestic China and the global market. The panel will also strive to produce possible policy suggestions and approaches to deal effectively with the crisis.